"My interest in free radio dates back to around 1981 when I first heard a station called Storeton Community Radio on Medium Wave. For months I listened in with friends and then it vanished. The station was taken off the air by the Radio Investigation Service. A year later I was tuning around and heard someone announcing a station called Channel 5 on Medium Wave. The station was only heard a few times and I lost interest until I heard someone on the CB talking about Radio Julie on 104.8MHz. There were other stations such as North Coast Radio and Radio Merseywaves on medium wave. I first heard Concept Radio around 1985. In 1989 I met the other half of Vision FM, Tom, through our mutual interest in CB radio. He was also interested in getting a station on the air, so we set about experimenting with circuits and old PMR (private mobile radio) equipment picked up at Amateur Radio Rallies. The first real breakthrough was in 1989 when we managed to put a 10 Watt signal out on 107.4MHz using a Storno radio, but there was still a problem with audio. PMR equipment was designed for "voice" only and had a deviation of around 5KHz from what I remember. For good audio we had to find a way of achieving at least 75KHz deviation. Because of the way the PLL and multiplier stages worked, it was unusable for anything apart from speech. The Storno was put to one side and I converted a Pye Westminster. The secret of the improved audio was down to where and how it was injected. A linear amplifier capable of around 65 Watts was plugged in and the tests started in mono. We had many locations to test from, some broadcasts were made from Warrington and others from Wirral. The antenna used for Vision was an indoor dipole, no doubt helped by a very good location with views over Liverpool and Wales. Other antennas ranging from a 5 element beam, a slim jim and also a colinear were tried at other locations to see how they performed. Many of the other stations around at the time such as Fox FM were in mono, so I decided to look into how FM stereo worked. I had been trying various experiments anyway, but soon realised that a 4053 and 4060 IC could be used with very few additional components to produce a good stereo encoder. All that remained was to build a new transmitter from scratch. The 20 Watts from a Philips power module in the output stage was sufficient for a considerable coverage because of the height of the antenna. 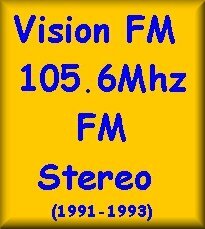 Vision FM operated on 105.6 MHz FM Stereo between 1991 and 1993 at various times, more regularly towards the end of 1992. The music ranged from "normal" to techno - most tastes were catered for. I even remember that a bit of Level 42 and Depeche Mode went out one Saturday following a request on the phone-in. Vision FM arranged a live link with a Manchester station called IBC on 101.7MHz. Sunday morning for the Strictly Black show featuring soul music on IBC was a favourite. Tom Webb from Concept even went live on Vision from a phone box one night! The discussion revolved around toasters and instant coffee, with a mention about a garden shed. We had a good laugh over the years and were never raided, probably because we had a "clean" transmitter and didnt cause a nuisance. The broadcast band at the time was fairly empty at the top end. Today the RA seem to have a policy of allocating every space to RSLs, maybe in an attempt to force free radio off as they do not have the resources or technical knowledge to go after everyone! Only one 6 hour recording of Vision FM ever survived thanks to Andrew from Paradox FM, there were no photographs of the station or people involved fortunately. We had the odd mention in Anoraks UK until the last transmission one Saturday night during the summer of 1993. Vision FM never returned...but who knows what might happen in the future if we all happen to meet up again."